Pat the bird dry with paper towels. 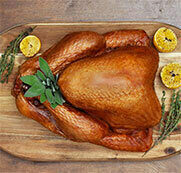 Rub olive oil all over the turkey, inside and out. Salt the outside of the turkey and the cavity. Combine the rest of the dry spices to make an herb seasoning. Generously sprinkle the herb seasoning inside the cavity and lightly rub over the exterior. Stuff the bird with the lemon slices and fresh herb bunches. Tuck both wings under the breast and tie the legs together. Place the carrots and onions in the bottom of the roasting pan and place the bird on top. Add the wine and the turkey broth to the bottom. 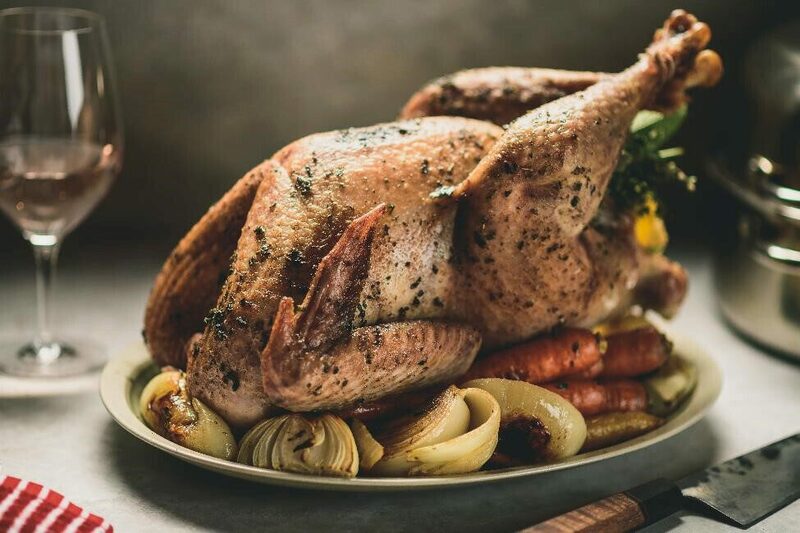 Roast the turkey for 4 – 4 ½ hours until the juices run clear and an instant thermometer reads 170°F in the breast and 180°F in the thigh. Remove the turkey from the oven and let rest for 20 minutes before carving.